Ji Chen Bihl, assistant professor in the Department of Pharmacology and Toxicology at the Boonshoft School of Medicine. 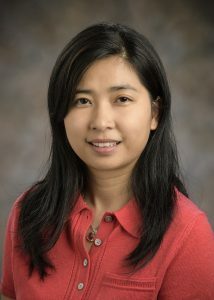 Ji Chen Bihl, M.D., Ph.D., assistant professor in the Department of Pharmacology and Toxicology at the Wright State University Boonshoft School of Medicine, has won five grants totaling more than $3 million from the American Diabetes Association, American Heart Association and National Institutes of Health. The grants support studies to unlock better treatments for ischemic stroke and reveal the intricacies of microvesicles and exosomes — important constituents of human blood and cerebrospinal fluid. It may be surprising to learn that Bihl did not always know she would opt to pursue the research side of medicine. As a medical student at the University of South China, she studied intensely but began to see that her professional efforts could have a much broader impact for human health if she shifted her focus to research. She became interested in the outstanding scientific progress she could achieve, and soon began a Ph.D. program at Peking University. Working in a lab there, she felt so excited to see cells culturing and growing. Her passions for scientific inquiry grew deeper as she observed how effectively drugs work on cells. She also was fortunate to assist in the creation of a drug that helps fight cancerous tumors. “Watching that and being a part of it gave me a lot of enthusiasm for how bench research can benefit clinical patients and change lives,” Bihl said. Thanks to a chance meeting at an international conference, Bihl learned about the Boonshoft School of Medicine. She met Yanfang Chen, M.D., Ph.D., professor of pharmacology and toxicology, neurology and internal medicine, who has extensive experience researching stem cells and vascular diseases. Attracted by Chen’s work, Bihl decided to apply to his group after completing her Ph.D. She began working at the medical school in 2010. Chen became her postdoctoral supervisor and is now a collaborator on many of her projects. One of the bioagents Bihl is researching in her lab today has the potential to be a very effective drug for stroke patients. The accomplishment is just one of many — Bihl has contributed more than 30 papers to the scientific community pertaining to vascular diseases. She also has built a robust research pipeline to better understand stroke and is investigating therapeutic roles played by endothelial progenitor cells. Bihl contributes much of her success to the supportive environment at the Wright State University Boonshoft School of Medicine. Her primary and long-term mentor, Chen, has always been very helpful with research or career advice. Bihl also credits Jeffrey Travers, M.D., Ph.D., chair of the Department of Pharmacology and Toxicology, with seeing the potential in her work.